There is a great variety of paintball gun brands, their models and types. All this can make it quite complicated and time consuming to find the right one for your needs. To help you in your search, we have compiled this guide with the best paintball gun reviews of the models that are popular and top rated in 2019. With our reviews you can find the right paintball rifle that fits in with your style of play. To make sure that you get the right features for your needs, it’s important to do prior research. So read our reviews and comparisons to decide which model you need. In selecting the top 10 models of paintball markers we used research we had done of the models that are highest rated, best sellers and offer the best features. 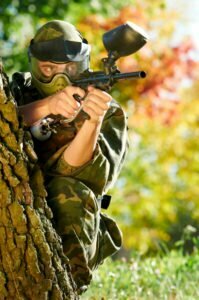 Check out the our list of top paintball markers comparison below. 14 What Is The Purpose of Your Paintball Gun? 15 How Much Will You Play? 16 How Much To Invest? 18 Electronic or Mechanical Marker? 19 What Type Of Paintball Will You Play? 21 Do You Need Centre Feed or Side Feed? 23 How to Choose a Gun That Fits Your Needs? 24 Below You Will Find Different Shapes and Styles of Paintball. 24.4 Mechanical or Electro-Pneumatic System? 25 How to Improve Your Accuracy? 27 How to Make Your Current Paintball Gun More Accurate? First on the list we have a true innovator in the paintball marker market called Tippmann TiPX and this is the second generation of this pistol. This paintball marker is a .68 caliber military style gun that is designed with C02 air system mechanism. In this second generation edition, the Tippmann team has now fixed a number of issues that its forerunner had and they have really stepped up their game with this unit and improved the overall design and functions. The TiPX is magazine-fed, semi-automatic pistol and actually feels and looks like a genuine gun. Paintball fans who prefer to use a gun that has an aesthetic appeal should opt-in for the TiPX. Once you handle this gun, you will feel the ultra-compact design that will become extremely handy for tactical backup or to mark solo targets. The great thing about the TiPX is how Tippmann highlights maximum-performance and provides you with an extremely cost effective marker. Rest assured that Tippmann does not sacrifice one element over the other. That way, you can be sure that you are handling high-rated, top-quality and cost-effective paintball gun. It’s extremely easy to dissemble the gun so dealing with maintenance is a piece-of-cake with this unit. You can easily personalize this marker because it includes threaded barrel which is suitable alongside just about any barrels of equivalent type and size. By having threaded barrel, you are able to invest and upgrade the barrel to fit your personal needs and wishes. The TiPX designers decided not to house the C02 air cartridges inside the magazine because they wanted to make the marker have less bulk on the grip and feel more balanced when you are playing. With less bulk, the grip is better and therefore you are able to operate the gun easily with just one had. Rather than housing the CO2 in the magazine, they are stored in a compartment that is based beneath the barrel and kept intact with a turn cap. This quarter-turn cap allows you to quickly remove and replace the cartridges, even if you are wearing thick paintball gloves. Overall, this marker is extremely light weighted and accurate paintball gun. You will enjoy more maneuverability during game-play and the magazines are cheap compared to other brands available. Plus, the awesome compact design makes it extremely easy to operate. If you are looking for an accurate, durable, reliable and ultra-light marker, then TiPX is a paintball pistol that you should consider. Here is a fantastic unit if you love scenario or tactical paintball games. Seriously, if you are looking for an edge over your opponent, you should give consideration to the awesome DAM Assault Matrix from Dye that is one of the most sophisticated equipment that you can get your hands on, we are talking about a superb quality marker here. It comes with a hefty price-tag but please, don’t let that stop you. The least you can do is to research and read what this marker has to offer. This is an extremely popular high-end marker and paintballers are literally waiting in lines to get their hands on this remarkable paintball gun. It features a fire-selector that will allow you to switch from Auto-Mode to Semi-Mode in no time at all. Additionally, you are able to custom-fit your own firing mode and integrate it into the switch selection mode also. Basically, having the switch mode system, you are able to switch from Semi-Auto mode to three round Burst-Mode and from there to full Auto-Mode. Having the ability to switch between modes like this will ensure that you are always set for the best firing mode for each and every scenario that you are playing in. The DAM is extremely lightweight, constructed with aluminum frame that will provide you with total control over your gun during any tactical game-play. It feels great to handle this 5.15 pounds (with mag) gun. Having such lightweight gun will give your comfort and joy during gameplay. You are able to play for hours and hours handling all the challenging game-play obstacles, holding your gun without dealing with fatigue or any discomfort at all. You will absolutely love this marker if you are into tactical scenario game-play. Such is the quality of the Dye DAM marker, that it can be right for anyone that plays tactical scenario paintball. I did mention it above that it this marker is a bit pricey. Beginners will most likely look for something simpler and more budget-friendly BUT if you are a seasoned paintballer and looking for a paintball gun that takes quality, customization and reliability to a whole new level, then you should give some thought to the DAM Matrix. Third on our list is the Empire Axe marker, built with high-quality and efficiency in mind. It completely leaves other similar high-end markers in the dust by offering superior features in a number of areas. But what makes the Empire Axe so dominant? If we start off by analyzing the shooting performance, it becomes evident where the strength of this unit lies. This marker is extremely accurate and fires easily. Shooting is pure joy with the Axe and you can be sure that the shooting process will be smooth, without delays at all. Regarding consistency, you will be pleasantly surprised to know that this markers offers between +-3 and +-5 on the chrono. If you have a marker with such consistency, you can bring your marker out on to the field with confidence. You can be sure, once you are out on the field that this marker will fire-off shots at fast speed rates and without any delays. You can play with different MODEs, such as ramping and semi-shooting modes. That way, it will make it even easier to fire off rapid shots. It is impossible to describe the feeling once you have this marker in your hand. It is extremely easy to hold, very light weighed and includes spacious frame that will fit any palm/hand size. You can literally play for hours and hours, holding the gun tight without even feeling fatigued in your arms, shoulder and hands. This will give you an edge over your opponents in paintball games that require endurance and speed. In summary, this marker is extremely comfortable to hold and you can rest assured that you will be able to fire rapid shots with ease and to top it all, the accuracy on this marker is phenomenal. You will master this gun in no time at all. Since it fires shots quite rapidly you might be thinking that it is noisy but that’s not the case with the Empire Paintball Axe Marker. It fires, at a fast speed rate, very quiet shots and there will be no mechanical issues/hassles to deal with and recoil will be absolute minimum (as long as the O-rings are consistently lubed). The Empire production team has really done their job to bring you an efficient and high-quality paintball marker and this unit is packed with awesome features. For this price tag, I urge you to seriously step-up your game and consider the Axe. Now, let’s take a look at the Dye Proto Rail Paintball Gun and right off the bat you can really see how this gun stands out for its awesome aesthetics. With its aggressively ambitious curves and lines that give it a trendy overall look. You might think, after seeing the stylish look of this gun, that it must be one expensive piece of marker. However, that’s not the case and this marker leaves its competitors in the dust with all the great features that it includes. A part from that, the Dye production team has gone the extra mile to provide users with quality, durable and efficient paintball marker. The amount of detail, excellence and dedication that they have put into this gun is really impressive. This marker is ideal for those who are making their first step in the paintball game and mid-level paintball players. Having said that, those of you who are seasoned players, playing at the absolute high level of competition will probably not be impressed with this marker. The body is very well built, made of aluminum composite frame making it extremely durable and perfectly designed for rough treatment. What I like about the design of this marker is how the ergonomic frame makes it so comfy to handle and with this perfect grip, you will have total control over the gun at all times. It goes without saying that paintball is a dirty, rough and hard-to-play sport and this marker is designed to handle all the toughness that you can find yourself facing. Another important element of this quality-built marker is how easy it is maintain the gun. To make the cleaning process as easy as possible, it includes color coded O-Rings. Having the O-rings in different colors makes it so easy to organize the O-Rings and you won’t have to deal with the confusion of figuring out what rings you need. Overall, this marker is extremely affordable but powerful and is perfect as an entry level paint-ball marker. The design is awesome and the impeccable quality features are hard to beat. Here we have one of the stylish looking beginners gun available today with an extremely appealing price tag, considering the performance and efficiency of this unit. If you are making your first steps in the paintball world, I advise you to consider this awesome marker. You probably will not be satisfied with this gun if you are seasoned player, but beginner to mid-level players will absolutely love this unit. Next up is the X7 Phenom from Tippmann. This fantastic marker incorporates a FlexValve technology that ensures maximum air efficiency by operating below 300 PSI. You will experience awesome performance from this unit, 1400 shots from 4500PSI easily. This is the first electro-pneumatic gun ever made that provides you with awesome features. These awesome features consist of manual & electronic firing modes, exceptional accuracy, consistency and remarkable air efficiency. Moreover, you will enjoy the ability to either use CO2 or compressed air. With this marker, you will have everything that you need to enhance your playing experience and mastering your personal playing style. This unit is perfect for high-end tournament fanatics and woodsball players will fall in love with this marker. The X7 Phenom is a .68 calibers and extremely effective paintball gun. It features a 9.5inch barrel that will allow you hit targets far away, up to 150ft with stunning accuracy. Furthermore, you are able to select 5 different firing modes by using the electronic trigger. These modes include PSP, Semi Auto, Safety Full Auto, NPPL and Response. On top of that, it incorporates a Cyclone feed system, so you can fire-up 15 paintballs per second without using the battery! This is one of the most efficient paintball gun on the market today. Featuring a stylish military design that you can customize to fit your own personal style. These looks include many different styles such as UMP, MP5, M16, and AK47 marker and many other types of rifles. One of my personal favorite feature is the ability to easily switch between electronic and manual operation. Another awesome feature (that I did mention above) is the FlexValve technology that will reduce recoil and maximizes air efficiency. If you are looking for a high-end and efficient paintball marker that is built with quality in mind, then I suggest you to seriously consider the X7 Phenom paintball gun from Tippmann. You will enjoy a versatile marker with abundance of power. It’s ideal for fast game-play and just perfect unit for woodsball paintball players who need lightweight and easy to handle gun. You are able to upgrade it to fit your preferred playing style and you can rest assured that this quality paintball marker will last you for years to come. Our next item is the Tippmann 98 Custom, the latest evolutionary phase from the popular Model 98. This model brings forward the finest attributes of its preceding version while still helping players to renovate the gun easily. The Tippmann 98 Custom includes a number of fantastic features and improved functionality. This marker is a killer choice for newbies because it is extremely easy to operate and you don’t have to clean it as often as other similar brands on the market. Current users love the way they can customize this gun with a number of upgrades and it’s among the most durable and reliable markers on the market. It’s designed to withstand the toughest scenarios. The game of paintball is all about falling, crawling, rolling, extreme weather and this gun is among the sturdiest on the market. Thanks to the design, which consists of high quality and durable metal, it will ensure comfortable grip both on the front and rear end. It doesn’t matter how long you play, it will feel light and soft and won’t affect your should or hands, even after hours of gameplay. Current owners did mention that the trigger is the perfect size for anyone, even those who wear thick gloves. They also praise the accuracy and performance. Another great feature is the ability to choose between CO2 and compressed air. Incorporating the latest firing technology, you are able to shoot 8 paintballs per second with the Tippmann Custom 98. Firing 8 rounds per second is more than enough for most paintballers. Also, it doesn’t use much air in comparison to other models available so this gun will last much longer than other similar brands. One of the best features of this marker is how easy it is to upgrade. These upgrades are dead simple to perform/install and you can rest assured that all accessories will be widely accessible to purchase. These upgrades include, for example, high end barrels, expansion chambers, custom shrouds, custom stocks, electronic conversion kits, cyclone feed systems, electronic grips, response triggers and drop forwards just to name options. This marker has a stylish look and the good thing is that you can easily add plenty of upgrades to make your gun fit your personal style or taste. The options are endless, you can easily step-up your game and transform your original marker into a sophisticated assault rifle if you wish. This option is extremely handy for those of you who love to play Mil-Sim or tactical paintball gameplay. This is a fantastic beginner marker where you can start-off playing woodsball or speedball game. Then, once you master your skill and experience you can upgrade to high-end Mil-Sim gameplay without breaking your bank. Next on the list is a tournament level sniper paintball marker with stylish look and durable design to withstand harsh conditions and yet deliver consistent performance. This marker was specially built for leisure paintball game-play to use in pump tournaments. It is built with Aluminum so it’s extremely lightweight to handle and very quiet in operation. What you get is a unit that includes a 14inch barrel with a 7.5inch control bore. The back barrel is quite small but the reason behind is that the paint is getting smaller and smaller every year so to keep up with the trend, the Empire team designed the barrels tiny to meet the market demand. Although the backs are .675, .680, and .685, the barrel is built with top-quality material and shoots extremely accurately. The 7inch control bore makes this barrel kit very efficient, durable and a top notch piece of kit. This marker is a very good and pleasant add-on to the great game of PUMP paintball game. It is not the cheapest marker available but quality comes with a price-tag and it goes without saying that you get what you pay for. What you get with this gun is quality value, regardless of your paintball skill level. This unit is basically packed with awesome features that any pump fanatic will greatly benefit from. It comes ready to play out-of-the-box and there is nothing else to do but head out on the field to play once you receive the package. If you are looking for a fantastic high-rated pump marker, you should consider the Empire Sniper. Here we have a trendy and stylish paintball marker from a reputable manufacturer that pride them self for being the trend-makers in the great game of paintball. This compact model is a versatile and easy to operate paintball marker that is known for its efficiency and accuracy on the field. The Mini GS includes so many great functions that makes it unique and basically quite unlike any other model on the market. Featuring the innovative ON/OFF ASA function is fantastic new add-on Mini GS. With the new ASA you are able to easily remove the tank with just a push of a button. The new ON/OFF ASA innovation makes this marker stand-out and is really one of the best paintball guns available out there. Having the ability to attach and remove the tank without any issues is an extremely handy feature. As soon as you handle the Empire Paintball Mini GS you’ll be pleasantly surprised by its performance and feel. It will fit the hands of any paintball player and the grip is extremely comfortable to hold, even after long periods of game-play. You can expect around 5-10 minutes to prepare and set the LED settings to fit your playing style for action on the field. It will take some time to master the art of maintaining and cleaning the Empire Mini GS and I would recommend you to get online and watch tutorials of how to take-apart and clean this marker. It can look like a daunting task for a beginner to remove all the small parts and clean them independently. But it will become and easy task to maintain this model once you have watched few step-by-step videos. In General, you’ll only need to take out the bolt to do most of the cleaning and you can expect around 5-6 minutes to take it out and lube it properly. Those of you who are looking for a light, durable and efficient gun will appreciate this marker. The fantastic hose-free design makes this unit really stand-out. It’s incredibly light weight and will be just perfect for anyone with medium to small sized hands. All in all, a reliable paintball gun that is easy to operate feels great to handle and should fit any paintballer regardless of skill level. The last marker on our list is a stunning and elegant paintball gun called Geo 3. 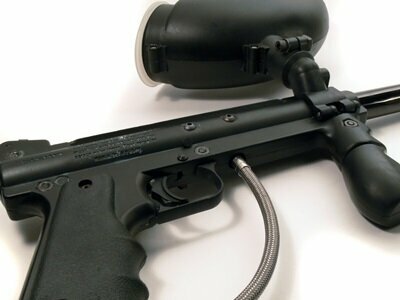 It is extremely slim and lightweight paintball gun. The Eclipse paintball gun production team has really transformed the way paintball guns operate by enhancing almost everything that they can to make this paintball gun operate flawlessly on the field. These enhancements include new eye covers, new solenoid adjustment screw, larger visual display, trimmed down milling, extended real rubber contact point and raised grip frame. These are major development in performance when compared to previous Geo models. You will be blown away by the performance of this model. Previous Geo markers have been getting top-rated reviews for years and the Eclipse team has improved every piece they can and added everything that the previous models were missing. This model takes the paintball to a whole new level with its consistency and accuracy. You will have no problems shooting across the field or corner to corner with stunning accuracy. It is so comfortable to hold and so lightweight that you will be able to easily jump, crawl and run without facing any fatigue in your arms or shoulders. With the adjumsent screw, you are able to fine tune the marker even further. It is fair to say that in terms of reliability, effectiveness and accuracy, the Geo3 is a high-quality marker that will not disappoint. It is extremely easy to maintain the Geo3 and you won’t need any tools or breakdown the gun. All you have to do is to clean the bolt and propshaft, lubricate and put together again. Additionally, you will only need to maintain the regulator every 2-3 months. Despite being a bit on the pricey side, the Geo3 is a paintball gun for any paintball players. Even if you are a beginner or seasoned tournament player, the Geo3 needs no tools to disassemble and therefore is dead easy to maintain. It will provide you with stunning performance and you will be able to dominate your opponents on the field with this gun. It is packed with features and is so versatile that I can honestly say that this is the only marker on the list that will fit any game-play style. If you want to master the game of paintball quickly and become the scoreboard leader, then I urge you to seriously consider the Geo3. You will get top-rated quality marker with stylish appearance, superb performance, durability, reliability and last but not least value for your money! Here we have an awesome looking, high performance, reliable unit that you can get your hands on for an extremely affordable price tag. This Paintball Marker highlights all the features of the high-priced models but for only the fraction of the cost. What you get with this marker are rails to attach any of your accessories, an 11 ported high performance barrel, a magazine that you can also use for storage and tons of other features. This paintball marker from US Army is perfect for those who like to play paintball up-close and on the edge. With the red laser sight, pressure switch and vertical fore-grip you will enjoy steady and stable shooting platform/base. This marker is an extremely versatile unit and a lot of reviewers state that this marker was designed specifically for Mil-Sim paintball game and is perfect for more advanced paintball game-plays, but the reality is that this unit is also perfect for the average paint-baller as well. So, if you are starting out, please don’t think that this marker is only designed for advanced players or military geeks. This unit is affordable, looks awesome and is extremely fun to play with and handle. You have to have in mind that this marker is not the best unit for those of you who prefer to play speedball. It is ideal for Mil-Sim, where you rely on team tactics or playing woodsball game. The reason why this gun in s not suitable for speedball lies in its mechanism, it has a low fire rate and is quite heavy to carry. Basically, what we have here is an extremely versatile tactical paintball gun that can take your paintball game-play to another level. The manufactures have raised the bar on quality, realism and performance with the Project Salvo marker. With this accurate and reliable marker, you will be able to master the game of paintball faster and if you want to enhance your gaming experience, this unit is definitely worth looking into. Paintball is a fantastic hobby to enjoy with friends or family and can of course be enjoyed in a competitive situation too. It is a hobby that requires healthy challenge, fun journey and also awesome way of burning off some calories while you are having fun at the same time. Participants competitively take-off for indoor or outdoor fields (sometimes both) that call for endless adventure user experience. 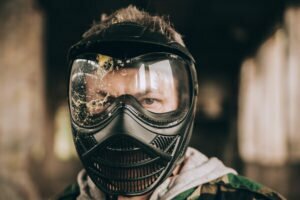 You will be challenging yourself mentally and physically because paintball demands strategic thinking, physical endurance, sentimental involvement of emotions and passion. This is something that you could never experience by playing tactical video games in the comfort of your own home. It is hard to describe the feeling when the adrenalin rushes through your veins when you are out there in the fields playing paintball. 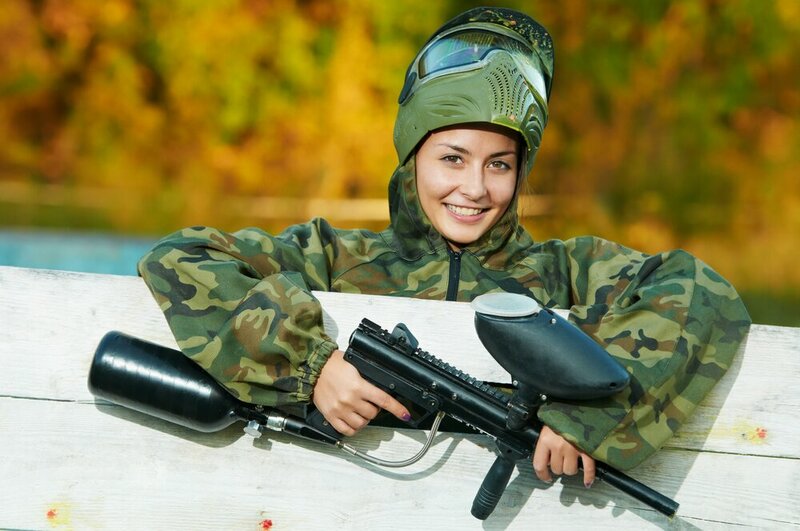 Once you try paintball, you will be desperate seeking your next doze of healthy adrenaline rush that you can only get by actively participate in paintball. 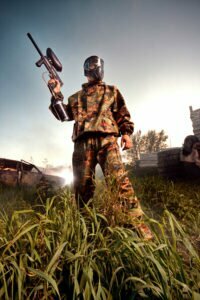 If you are planning on becoming a paintball player, there are several things you need to consider. It is not just about buying a paintball gun and storm-out to play. You need to invest in several other accessories like markers and other equipment along with upgrades that are essential to maximize your experience. Feel free to explore my detailed reviews about some of the greatest paintball guns available where you will find comprehensive information that will help you to make an informed decision about the perfect paintball that will fit your playing style. 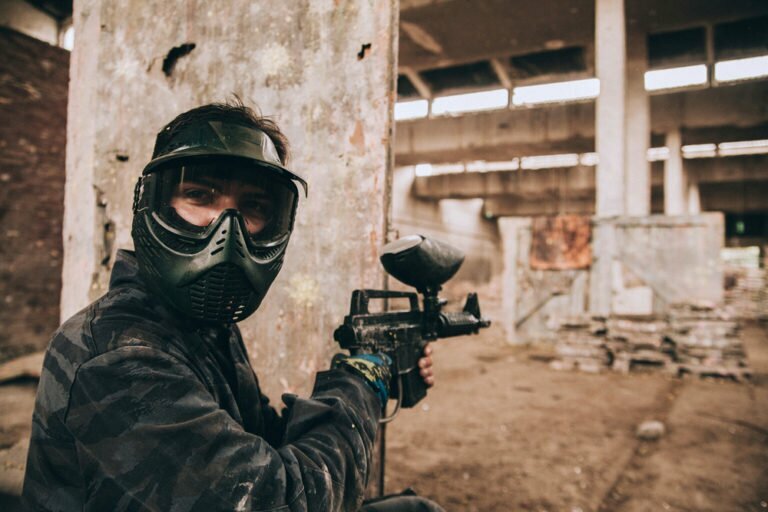 As a paintball enthusiastic, you are inclined to invest in a good paintball gun that fits your budget and one that will last you for several years. You need to be on the lookout for one that will fit your playing style, match your skill level, interests and fits within your budget. 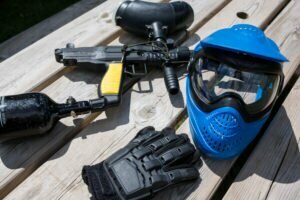 It might seem a daunting task to re-search the best paintball equipment but rest assured, below you will find all the information that you need to help you out. Although I did mention here above that it can be a daunting task to find your perfect gun, it can actually be as simple as just picking up any paintball randomly that your friend recommended to you. However, the best way is to do your own research and find out what kind of gun you need and what kind of paintball you plan on playing. Your friend’s perfect gun might now fit your style of play. Therefore, you have to take the time to investigate and understand different paintball gun reviews before you decide what to purchase. It really takes commitment to invest in a paintball gun and you should choose your own gun by carefully consider numerous elements such as its features, quality and abilities. What Is The Purpose of Your Paintball Gun? It is to hit the opponent with a paintball splash that is done at high-speeds. In all paintball guns the paint is stored in a cartridge that is loaded into the gun. It is very important to look closely into how the paintball is loaded and fired before you choose your paintball gun. The top-rated paintball guns have different ways of loading paint balls into the feed. My comprehensive paintball gun comparison will examine the details as to how the loading improves or decreases your playing skill. You should have in mind that even a excellent paintball rifle includes the basic feature of pressing the paintball at a specific pace and filling the chamber again. Having said that, the operation of loading the compartment/chamber can be set to automatic or done manually. You will find many reviews online that will encourage you to invest in a pneumatic electronicone paintball gun and there are so many semi-automatic and mechanical guns available to purchase. But most users seem to favor the pneumatic and it is safe to declare that you will have a trusted device in your hands if you go for pneumatic. How Much Will You Play? 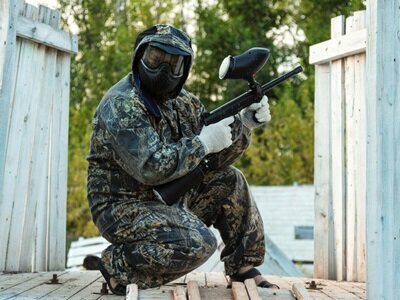 There are many levels of game-play to choose from when playing paintball. Those who are starting out usually begin playing woodsball for a few hours. The good thing about starting out is that you can go visit the fields and you can most of the time rent a paintball gun. 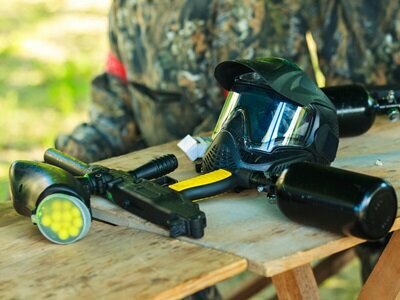 That way, you can get the feel of how the game is played and the basic functions of a paintball gun. 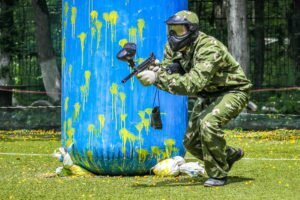 This is great way to Try-Before-You-Buy and then you can make a decision later if paintball is something that you think you will enjoy playing. Those of you who are planning on playing for extended periods of time and in tougher scenarios should seriously consider buying the top-rated guns. Most of the paintball gun reviews you will find online will boast popular guns and praise their performance over time. My reviews focus on user experience, feasibility, quality, equipment needed, accuracy and other essential features. Maybe after you have played SpeedBall or RecreationalBall for a while, it might be a good idea to invest in a top-rated high-end gun. If you are planning on playing in a tournament, don’t try to save few bucks, increase your budget a little bit and go for the best. But, it has to be a gun that fits your playing style. Going for the top-rated tournament gun will pay-off long term and will maximize your paintball experience as well. Once you figure out what type of paintball you want to play, head over to my tournament section where you can find detailed information about the best paintball gun for tournaments. This is probably one of the most important elements of the buying process, how much cash should you put on the table? The reality is that we are all different with different needs and different people have different budget when comes to shopping for the perfect gun. You have to know your limits and you should dedicate time to process all the information you can get about paintball. All the hard re-search work will pay off eventually because if you don’t do your research properly, paintball can become extremely frustrating sport if you end up with a gun that you did not research thoroughly before purchase. Therefore, it’s extremely important to investigate everything that you can get your hands on about the gun that you think is your perfect fit. The top-rated paintball guns are not cheap, but if you find a gun that fits your skill level and will not break your bank, by all means go for it! The good thing about paintball guns is that you are able to buy used top-quality gun. Although it is used, it doesn’t mean that it’s bad. Highly favored used gun can serve you for a long time. If you are looking for a budget friendly paintball gun, you should check out the used guns. BUT, you will never know how the last owner maintained the gun, or even if he cleaned it properly. Maintenance is a key factor that will determine how long your gun will function properly. I suggest you buy a new gun, given that you can afford it because then you will receive a clean gun and accessories right off the production belt. Then it is up to you how long the gun will serve you because the way you treat your gun will determine how long it lasts. You can choose to buy a paintball gun which is new or used, depending on your skill level and budget. Having said all that, maintenance of a used gun will be a lot harder than of a new one because you will never ever know how previous owner maintained the gun. As I said earlier, a brand new gun straight out of the box might strike you as an expensive unit but keep in mind that we are talking about top-rated guns, the best ones on the market. Once you have your list of chosen guns, the next step would be to carefully compare the guns. I want to mention one important factor about the NEW vs. USED gun debate. The fact is, once you buy a new gun you will get a warranty that will last from 1-3 years. However, if you go for a used gun, you have no guarantee of how the gun was treated by previous owner and you will have no manufacturer warranty either. There are different levels of paintball guns available for sale and the guns are specifically designed for different kinds of paintball play. Notice that most of the medium to high-end paintball guns are perfect to use for Recreational-Ball or Speed-Ball scenarios. On the other hand, a low end gun is probably best to use at a beginner level or if the user is young, such as a young member of the family. For tournaments, the best choice is always high-end paintball gun. Once again, the best way to determine which paintball gun is best for your playing style is to read over my detailed paintball marker reviews and then you will understand exactly what you can get out of your desired gun. Notice that even the very best tournament users will always scan through the detailed information before they make up their mind. If you are a beginner, there is a chance that you just don’t see the point of comparing different high-end paintball guns. 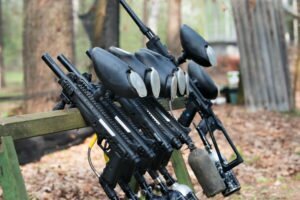 In that case, you could start off by exploring the low-end guns or even head out on the fields and rent a gun to get the feel of handling a paintball gun. After some time, then you can upgrade to a medium and high-end gun as your skill increases. The more you play and practice, the more you advance. 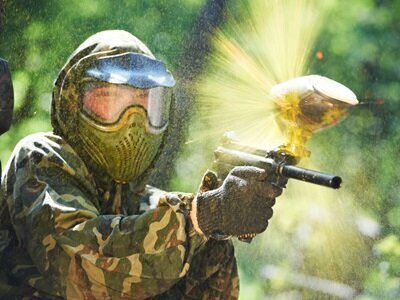 Moreover, the more you master the skill of paintball playing, the hungry you will get for bigger and more efficient gun. The first challenge you face when you are deciding on a paintball gun is to choose the model. Important factor to notice is that both electronic and mechanical guns will serve the same purpose of shooting. However, they will do it in different ways. The mechanical guns are known for their reliability and a mechanical gun could be your best choice because of its low maintenance factors. One of the best things of owning a mechanical gun is how easy it is to maintain and also the replacement parts are easily available online and they are not expensive at all. For the experienced players out there, an electronic gun might be your best fit. Have in mind though that the maintenance is different. Many of you guys out there would prefer to play with electro-pneumatic gun simply because it operates on batteries and circuit. The downside is that repair cost is higher but there are so many cheap repair kits available that will do the job properly in no time. What Type Of Paintball Will You Play? 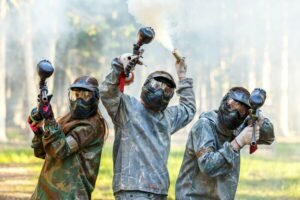 If you’re planning to commit most of your playing time with your family members, the best option for you would be to consider a paintball gun for woodsball scenario. In the same way, in case you’re extremely competitive player and you are hungry for an adventure in a large open field then you should seriously consider playing speedBall or recBall environment. There are some accessories that you need to consider for your gameplay and to select the right gear is relatively easy task to do. The majority of folks simply pick-up the gear that looks the best, paying no attention to what type of gameplay each unit is manufactured for. Below you will find few pointers to keep in mind regarding unique tools for your paintball gun. The majority of beginners would of course head-out and read the best beginners paintball article and choose a good paintball marker for beginners and as for the advanced players, they would read the tournament articles for a paintball guns. Each section/article is devoted to suit the players level of skill, beginner or advanced. Basically, beginners should consider equipment that is lighter and smaller while advanced players would consider a gun with more features and heavier. The cartridges that hold the paint are loaded in-to the chamber of your paintball gun will use either CO2 or HPA gas. Generally speaking, mechanical guns and electronic guns use different kinds of gases to maximize the performance. The factor that determines whether your gun uses HPA or CO2 will depend on what kind of paintball gun you choose. The gas is different for each gun. Many users prefer a mechanical gun simply because it’s cheaper to maintain and only uses CO2. The fact about CO2 is that it has a mild stability issue at different temperatures but still it is perfect for mechanical paintball guns. On the other hand, HPA is expensive and is used on electronic guns. Most of the reviews that you will find state that you should use CO2 on Electro-Pneumatic paintball guns but electronic guns are extremely accurate when comes to design and CO2 tends to leak and collect dirt. Therefore, maintenance is harder with electronic guns. ALWAYS use the gas that the manufacturer suggests, it will be a disaster to maintain your gun properly if you fill it up with the wrong gas. Using HPA gas is extremely cost effective and should be used on electro-pneumatic units. If you want to modify your gun for different gas, have in mind that it will probably cost a considerable amount of money. Most of the guns available are designed to use CO2 and you can expect to pay around 5-10 bucks. 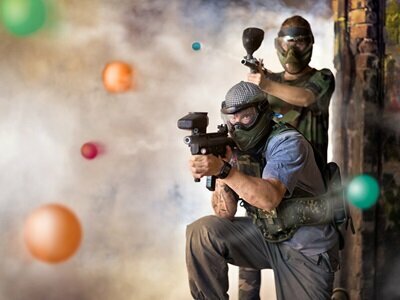 Using mechanical paintball guns will enhance and extend the game play without hindrance because there is a refill area on most paintball fields. Do You Need Centre Feed or Side Feed? A big plus for a paintball gun is to include a centre feed because the paint balls will drop straight into the chamber without the need to move at an angle, like it does with a side feed. Centre fed guns are ideal for speedball. However, most of the popular mechanical guns include a side feed. Once you’ve mastered your gun, you will be pleasantly surprised to find out that it might be easier for you to use a gun with a side feed. This will of course depend on your level of skill, and actually it is up to each individual preference to determine centre or side feed. Maybe you are a player that likes to hide and wait for the perfect shot, in that case, side feed will work perfectly for you. However, for those of you who are playing out in the open that demand fast moves and a lot of running, then you should consider a centre fed gun. If you want to change from centre-feed to side-feed or vice versa, you can purchase custom kits to modify your unit. The process is relatively simple task to perform, you just drill a hole at the top of the gun to allow the ball to drop directly in to the feed neck, that’s it! As I have mentioned above several times, each player is different and we all need to pay close attention to our preferred gameplay style. Therefore, depending on the level of your skill, there are different kinds of equipment that you need on the fields. It’s not just about buying the biggest and most expensive paintball gun, you need other accessories like paintball masks, hoppers, air tanks, cloths, maintenance kit etc. and all these items are readily available online. It all depends on how long you plan on playing, and the amount of pressure that you will withstand on the fields while playing. If you want to last hours playing, you need to be prepared with tool-kit such as screwdrivers and Allen wrenches even though you are playing with the top-rated gun. To enhance your playing experience, you should invest in a paintball vest and mask just to spice up the game. How to Choose a Gun That Fits Your Needs? To begin with, it is important to figure out how much you want to invest in a gun. The truth is, paintball is expensive hobby/sport and of course you would not want to finish your budget on a gun because there is so much more to paintball than just the marker. You must think about the paint and the gear also. Therefore, it is important to set a budget in a way that you limit your budget and consider how much you are going to spend. Choose a paintball gun that will fit your budget, and make sure you have enough to invest in paint and gear. You should also have your eyes open for used or old model because it could save you a fortune to buy older model. The prices of older models tend to decrease significantly. You need to consider what kind of paint-ball player you are and how you intent to play the game. Do you go to a paintball field just every now and then? Do you play with your friends in a backyard? Are you planning on competing in paintball tournaments that will require you to buy top-rated equipment? Do you practice every day? There are many things that need to be taken into account depending on what type of paintball player you are. The most crucial decision to make is to select the proper gun and gear that fits your style of playing. Price is also important, because you would not want to end up in your backyard with your award winning $2000 gun or end up in the tournament field, holding a military-simulation that shoots only laser. Lastly, and most importantly (as I did mention above) look for a gun that fits your playing style. Does the gun feel good in your hands and does it look good as well? Maybe you don’t care about the looks, and in fact many players out there don’t give a sh**t about how their gun looks, but the reality is that your gun has to make you happy! If your gun is an eye opener every time you look at it and feel it, you have found a unit that satisfies your needs. Otherwise, it will most likely just end up in your garage or closet and will just collect dust. However, even though your gun can get you smile when you look at it, it also must give you the right feeling every time you hold it and use it. Some like heavy guns, some like lengthy, and other like light guns etc. Therefore, it is extremely important to get the feel for the gun before you head out on the field or your backyard. Take the time to master your gun and get the feel for how it works. 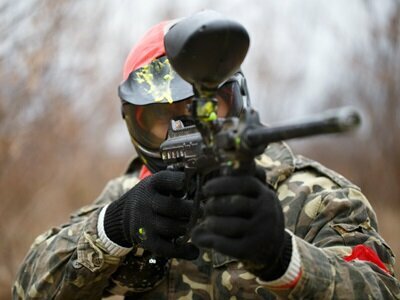 Below You Will Find Different Shapes and Styles of Paintball. Scenario or Mil-Sim categories are most of the time used interchangeably because scenario play often call for a some sort of military-scenarios that will spice up the game quite a lot. Players experience themself in military situations, completing military tasks, such as being a part of scenarios that involve team-based objective like securing control points, save a hostage or even capture an enemy headquarters and so on. These Mil-Sim games may often last many days, and could sometimes stretch over a week in some cases. Everything is carefully planned and players have their specific playing time and resting time. Sometimes these kinds of scenario games can include hundreds, or even thousand of players. For beginners, scenario games can often feel extremely exhilarating and at the same time frightening. Scenario players will carry all kinds of guns, in all kinds of shapes and that include all kind of looking. As I did mention above, it is somehow important to pay attention to look and a Mil-Sim fanatic will of course choose a military looking gun that will function efficiently as a woodsball gun. This type of game is extremely fast paced and will usually last around 3-4 minutes. Although it only lasts few minutes, it does not mean that nothing happens! When you are playing speedball games, you will have to move very quickly in order to get the perfect angle on your fellow opponents that are covering them self behind specially designed bunkers. During speedball play, thousands of paint balls are shot between players during gameplay and you can expect to witness more than 10 rounds played in just under 10 minutes of play. If your paintball gun contains a mechanical firing system, every shot is fired when you squeeze the trigger. There is no electronic mechanism and only one shot will be fired from the gun as you pull the trigger. These types of mechanical guns are often very easy to use, maintenance is easy and very budget friendly. Therefore, this type is extremely useful for beginners. The other types are so called electro-pneumatic guns that function differently and they utilize electricity to fire. Most of the time, they will include some type of easy-to-understand programming. The user has the option to select Firing-Mode, Semi automatic, Ramping, Burst and Balls/Per-Second shots. Keep in mind that electro-pneumatic guns require either standard 9volt battery or intergraded re-chargeable battery. The electro-pneumatic guns are more complex and they are also more expensive. It does take some learning curve to master them and they need more maintenance attention than mechanical markers. BUT, they are much more efficient, include more choices and are faster than mechanical guns. One point that I need to mention and make perfectly clear, any marker can be used with compressed air (HPA). However, mechanical guns should only use CO2 because of the reason stated below. Gas is not just gas! CO2 (known as Carbon dioxide) and HPA (known as compressed air) are very different gases that function differently under a variety of conditions. For example, CO2 consistency drops significantly at lower temperatures which make efficiency and accuracy vary per each shot. On the other hand, at normal temperature, the CO2 is more stable. There is an additional problem with the CO2, inside the container, the CO2 is liquefied and can leak out causing internal damage which will then later cause malfunctions and affect the accuracy of each shot. This is why it is the perfect gas for mechanical guns. They have large and easy-to open bodies that result in greater tolerance of hard usage. Moreover, they are extremely easy to clean. With the electro-pneumatic guns, you get a unit that is thinner on the inside. Therefore, they must include a propellant that does its job flawlessly at a higher firing rate at any temperature. There is yet another thing to bear in mind, and that is the price-tag. Also, you need to be aware of popularity of each gas. The basic fact is that CO2 is inexpensive and the tanks are all significantly cheaper than if you would pick a tank withHPA. Whenever you need to refill the tank, you will have to pay around 5-10 bucks. If you are playing in the field, you will be able to fill-up your tank, so rest assured that you can play all day long. Now let’s move on to HPA, and the fact that compressed gas (HPA) is relatively more expensive and some fields might not allow you to enter with compressed air because the compressors are so expensive. Tanks with HPA are also extremely expensive and will be in the $150-200 range. Having said that, if you intent to use high range electric gun, then compressed air (HPA) will turn out as a more affordable option because of the cost of altering your electric unit to fit CO2. Therefore, it will turn out to be similar as if you would just go to the store and buy HPA tank. Final reminder, have in mind that mechanical guns are able to support any propallant while electro-pneumatic fit HPA system. 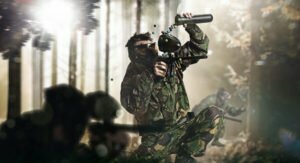 I hope that this guide will help you to spot the perfect paintball that will fit your needs and playing style. There are thousands of guns out there to pick from but you need to select the proper one that suits you and brings a smile on you every time you handle it. Remember, the final decision is up to you and I hope my website has given you the information you need to make up your mind and have in mind as they say, A Quality Marker Lasts For Life! The best way to improve your accuracy is to dedicate time and effort to learn how your gun works. Be patient and stick to your gun and master it, it will pay off eventually. If you stick by your marker and properly master it, you will be familiar with the way it shoots. Moreover, you will automatically learn how to compensate for deviations inside the trajectory. Another important factor of the learning curve is that you’ll moreover be able to tackle any maintenance issues than by operating a gun that you are not familiar with. Another important factor of accuracy is practice. You need to practice to improve accuracy and with improved accuracy you will get better. The question is though, how do you practice? For example, you can start off by locating a place where you can practice your shooting safely. Start off by shooting at non-moving target and then, once you improve your skills, steadily begin firing at moving targets. Last but not least, experiments by incorporating your own moves until you reach high-hit rate level. 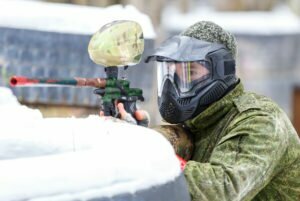 Although you invest in the most accurate paintball gun available in the market, there is still some learning curve to do and you will still run into trouble using it. You need to be able to evaluate your accuracy skill somehow. Understand that you will not be able to shoot accurately just by practicing once per month. You need to devote time to practice and learn your paintball gun. Invest time to practice, it will pay off eventually. To extend our knowledge about accuracy there are few things that you need to understand. Accuracy is the ability to hit your target in first shot, regardless of the distance where you are set. It is important to enhance your aim by gradually practice shooting and get used to your gun so that you precisely know where your aim should originate. Once you have practiced and mastered the accuracy it is time to work on your positions. Proper position will give you great advantage in the field. Now let’s move on to positions. The very best position to shoot accurately from is prone position where you are lying flat on the ground. You should take time to learn, practice and adopt this position because you will be able to hide from your opponents and it will give you sufficient breathing space to set your accuracy for your next shot. To properly master a prone position, you need to lie down completely flat on the ground with your elbows up. But why is prone position so effective? Prone position allows you to shoot accurately because your body and your gun are stable. That way, you will have sufficient space to position your “prey” steadily and shoot accurately. Standing while you shoot is a position that you can execute once you have gained some confidence using your gun after some practice time. To start with, prone is the best position but it is logical that at a certain point during the game you will need to get up and move. If your target is far away, the standing position is crucial. Just make sure that when you are on your foot shooting that your body is well hidden so your opponents won’t spot you right away. The downside of standing, compared to prone position, is that when you are on your feet you don’t have the same room to easily set your marker down for accuracy. The best standing position is to make sure that your legs are bent and your feet spread so you can balance yourself properly. There is a chance that your desired paintball gun, with all the features you can dream off, will come with a hefty price tag but you have to think long-term. Don’t try to save few bucks on a paintball gun and accessories. If you believe that a certain gun will match your skill level and that you are ready to devote time to master the gun, then please by all means go for it and make sure that you maintain your gun and accessories properly. Like I did mention many times here above, there are so many factors that affect accuracy. Yet another key factor is the barrel that you have with your gun. You have the option to upgrade your current barrel by buying a stand-alone barrel and customize it to fit your current marker. Pre-installed barrels might spread out way too much air than necessary and that will hinder the accuracy. Moreover, you need to pay close attention to the size of the barrel you want to buy because the length of a barrel can also affect accuracy. It is a common belief among game-players that if you have long barrel then your shot is more accurate. However, this is not the case because of the simple fact that the most accurate paintball units include small barrels. So, if you invest in a new barrel, make sure it is built for precision. How to Make Your Current Paintball Gun More Accurate? Keep in mind that there are many things you can do to improve your accuracy on your current paintball gun. Firstly, you need to have a marker that is customizable. This is an option that you should consider if you don’t want to purchase expensive unit and you already have a market that you can modify and that has served your well over time. Battery life also influences accuracy. You need to pay close attention to the battery because it can be hard to know when the battery life starts to decrease. In some cases, you might not even realize that your battery life is going down. Once the battery life decreases, it will slow the shooting velocity and the accuracy will drop. To fix that problem, always be ready with a spare battery and get back to the game! It’s important to master the skill of paintball. Once you practice enough and you realize that your overall skill is what influences your accuracy. Maybe you have the best paintball gun in the world that is quick and accurate in your hand but if you don’t master it, or watch your position, practice your skills, you will never ever shoot accurately. I really hope that my comprehensive paintball buying guide with our paintball gun reviews has helped you to figure out what paintball marker is the ideal choice for you. You need a gun that fits your preferred style and needs. There are so many guns available and it might seem like a daunting task to go through every single marker on the market. I wanted to create a paintball information website that would include everything that you will ever need to know to be able to make an informed decision on what marker fits your needs. Go through the reviews, take notes and thoroughly investigate what gun could be your perfect fit because a gun that fits your needs will bring you joy and excitement on the field!